the Girl Scouts in 1912. — Dangerous for deaf to deliver mail? Is it dangerous for a deaf person to deliver mail? dog. He could not hear the dog barking and was bit. 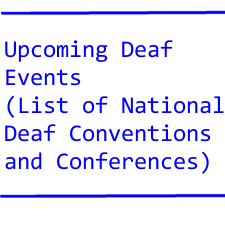 first DeafDigest has known about. — A deaf person not allowed to race horses? not thoroughbreds, two different types of races. work with deaf have never been honored until this year. in Japan. This agency helps the deaf with their needs. the world under age of 30.